There is a fascinating and quite boring article in ‘Newsweek’ about the creativity gap, how creativity is declining in America. Reading it I couldn’t stop thinking about the motorcycle business and specifically Harley-Davidson. Given it’s earning season; H-D announce earnings HERE, now it’s Polaris Industries Inc. (NYSE: PII), makers of the Victory motorcycles turn who reported its Q2’10 net income of $25.6 million. By comparison, the 2009 second quarter net income was $17.5 million. Sales for the second quarter 2010 totaled $430.9 million, an increase of 25% from $345.9 million recorded in the year-earlier period. Yeah, but you’re likely saying that’s all ATV and snowmobile sales, right? True the lions share is off-road sales, but specific to sales of the On-Road Division, which primarily consists of Victory motorcycles, they saw an increase of 48% during the second quarter of 2010 vs. the same period in 2009. The N.A. heavyweight cruiser and touring motorcycle industry remained weak during the quarter, but Victory motorcycles had strong retail sales during the second quarter, increasing more than 10% in N.A. compared to the second quarter last year, resulting in overall market share gains and retail sales growth for the third consecutive quarter. The increased demand reflects the popularity of the new 2010 Cross Country and Cross Roads touring models. The N.A. 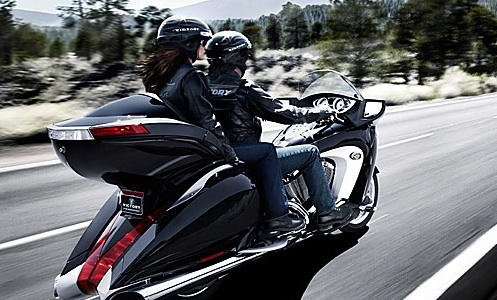 dealer inventory of Victory motorcycles declined 32% in the Q2’10 compared to 2009 comparable levels. The sale of Victory motorcycles in markets outside of N.A. continues to accelerate, with sales reaching 25% of total On-Road/Victory sales for the year-to-date period. And lastly the income from Polaris financial services was $4.2 million for Q2’10 compared to $4.0 million in 2009. I can’t put my finger on it, but there is something missing for me with the Victory motorcycle. Maybe it’s just the “bar-n-shield” logo and now my bias is showing? But I balk at comments from riders that claim Victory is NOT a threat or competition for H-D… it just doesn’t ring true. The cruisers are more roomy, the engine has more HP, the motorcycle is lighter, has a lower seat, larger saddlebags all at a cost of thousands less means Victory is doing a lot RIGHT on the creativity front. In other words, the Harley-Davidson businessmen look to squeeze all the creativity out in the name of profits. And now the business is in the hands of the manufacturing line worker, who are always the least creative element in the chain. The engineers designed out cost, the line-worker built them at the lowest cost, the dealer sold them slightly above cost. Now the company is trying to fix the business, but are flummoxed. Do they truly think cutting out cost, means somehow people will magically appear? They’re not and meanwhile Victory ratchet’s up innovation. Photo courtesy of Polaris/Victory Motorcycles.